The Westborough Water District would like to remind its customers of the importance of water conservation. Water your garden and lawn early in the morning rather than mid-day and water your lawn only when it needs it. Step on your grass and if it springs back when you lift your foot, it doesn't need water. So, set your sprinklers for less frequent watering. Better yet, in times of drought, water with a hose! Fix leaky faucets, leaky toilets, and plumbing joints as soon as they are detected. Don't run the hose while washing your car. Use a bucket of water and a quick hose rinse at the end with a trigger nozzle that automatically turns off. You’ll save a significant amount of water if you wash your cars frequently. Select correct water levels for laundry loads and wash only full loads in the washing machine and dishwasher. Take quick showers rather than full-tub baths. Even a one- or two-minute reduction can save up to 700 gallons a month. Don’t let the water run when brushing your teeth, washing your face, or shaving. Use a broom instead of a hose to clean patios, decks, driveways, and sidewalks. Position sprinklers so they are not wasting water by spraying the house, sidewalk, or street. Rebate programs are an incentive to get customers that are contemplating purchasing a new toilet or washing machine to purchase one that is low flow and/or energy efficient. Click here for more information about our current rebate programs. Make your garden beautiful and more water efficient. 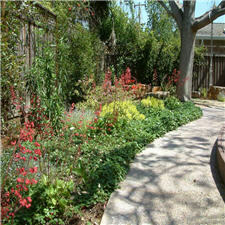 Transform your current landscaping to the garden you want and use water more efficiently. Sign up for FREE water-wise landscaping classes offered by the Bay Area Water Supply & Conservation Agency (BAWSCA). To view a list of classes and to register online, visit BAWCA Landscape Classes. Registration is required to attend. 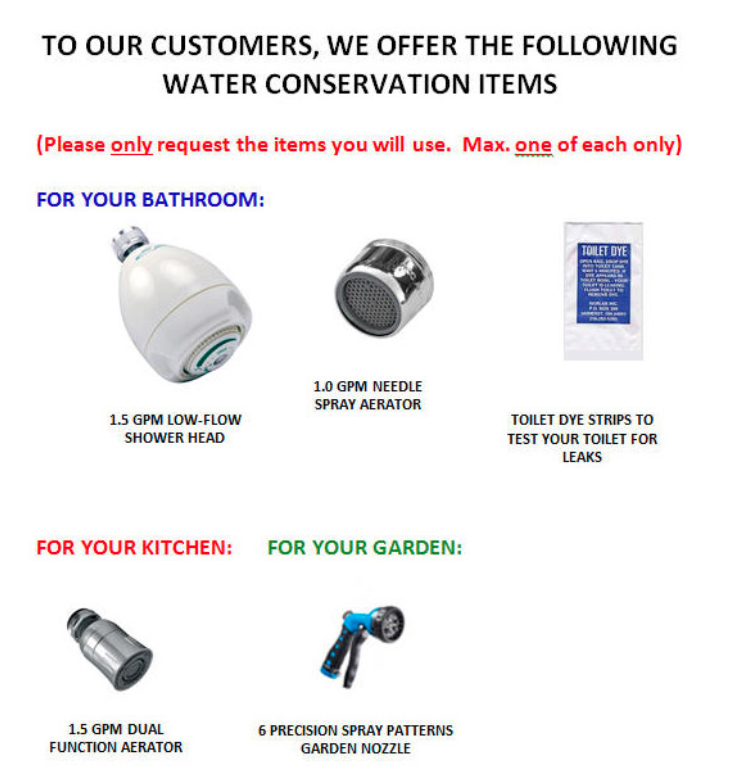 Free Water Conservation Products Available! Toilet Leaks: Some toilet leaks make a running sound. Others are silent. To detect a silent leak, put some drops of food coloring into your toilet tank. Wait twenty minutes. If there is coloring in the bowl, you have a leak. Many toilet leaks can be fixed with simple tools and a do-it-yourself manual. The WWD can also provide you with toilet dye strips to help you test your toilets. Method 1: Turn off all water taps inside and outside your home. Record the meter reading and return in two to three hours to check for change in the reading. If the meter reading has changed, you may have a leak. Click here to learn how to read your meter. Method 2: Most of the meters have a small black or red triangle on the meter designed to detect even small leaks. If this triangle is moving when you have all water off inside and outside your home, you may have a leak. Click here to learn how to read your meter. Common sources of leaks are a toilet that is running, a constant drip in a sink or outdoor faucet, a loose or dripping washer connection, or a home water treatment unit. If you still not sure whether or not you have a leak your location, the Westborough Water District field staff will gladly conduct a leak test free of charge for any of its customers. This leak test requires that the customer not use any water for approximately four hours. The District Field Staff will monitor the meter, calculate any usage, and contact the customer with the results. PLEASE NOTE THAT THE DISTRICT FIELD STAFF WILL NOTIFY CUSTOMER IF THERE IS A LEAK(S) DETECTED, BUT THE DISTRICT IS NOT RESPONSIBLE FOR LOCATING THE ORIGIN OF THE LEAK(S). IT IS THE CUSTOMER’S OBLIGATION TO LOCATE THE LEAK(S) AND REPAIR IT (THEM).